This dish is delicious and gets better the next day for leftovers. We made this to taste slightly spicy, which was a nice flavor with the capers. However, the red pepper flakes can be left out if you wish. 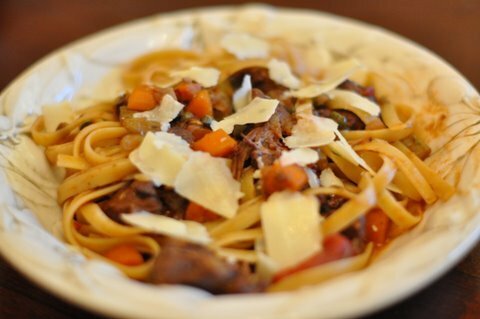 Such a great dish for a cold fall or winter night! -Heat the oil in a dutch oven and sear the meat on all sides. You should sear in batches. Remove the meat from the pan and set aside. In same pan, saute the carrot, onion and celery. Add olive oil if too dry. Add the meat, all spices and herbs, the tomato puree and red pepper flakes (if using). Saute the mixture on high heat while stirring, until the tomato puree starts to smell sweet. Add the red wine and stir. 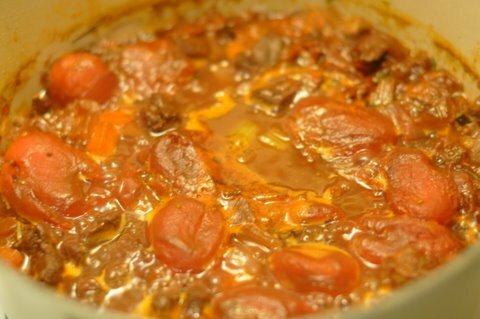 Fold in the peeled tomatoes and enough broth to immerse the meat. Simmer on low heat for 1 1/2 hours with the lid left ajar on the pan. Check occasionally to make sure there is enough moisture in the pan, if not add more broth. When finished, taste and add salt & pepper. Remember that the capers you add will also add salt to the dish. -Bring a pot of water to boil and add the pasta. Cook the pasta until it is al dente. Drain and rinse the pasta under cold water. Add the pasta to the ragu, stir in the capers, a dab of butter, and a dash of olive oil. Let stand for a few minutes away from the heat. Serve immediately and top with the cheese. Enjoy! ** One of my most favorite cooking pieces I have is my Le Creuset Dutch oven. I’m obsessed with cooking in it. It has never failed me! Williams-Sonoma has so many pieces and colors, such beautiful pieces.